Your Price: Due to its weight, this product carries an additional shipping surcharge of $1.00. 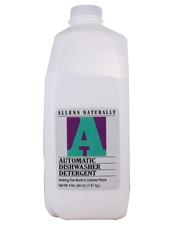 Product Description: Allens Naturally Automatic Dishwasher Detergent is a superior dishwashing performer containing ingredients to soften water, prevent spotting of glassware and cut grease. * Cruelty-Free: Never animal tested and contains no animal products. * Concentrated: Use less for better value. * Sensitive to Your Senses: Contains no perfumes or dyes, common allergy-inducing ingredients. Warnings: Eye irritant. Avoid contact with eyes. In case of eye contact, remove contact lens, flush eye thoroughly and repeatedly with water. Call physician if necessary. Keep out of reach of children. Additional Info: Not tested on animals. Does Not Contain: Dyes, Perfumes or Animal Ingredients. Suggested Use: Follow dishwasher manufacturer's instructions. Use hot water (140F to 160F). Position dishes so that water spray reaches all soiled surfaces. Use 1-1/2 tablespoons per dispensing cup. Large loads, very soiled dishes, or hard water may require more detergent. * Run hot water at sink before starting water. * Detergent cups must be dry before adding detergents.